A local care home is asking people to donate to create lap mats ‘twiddle mits’ and ‘fidget boards’ for those living with dementia. 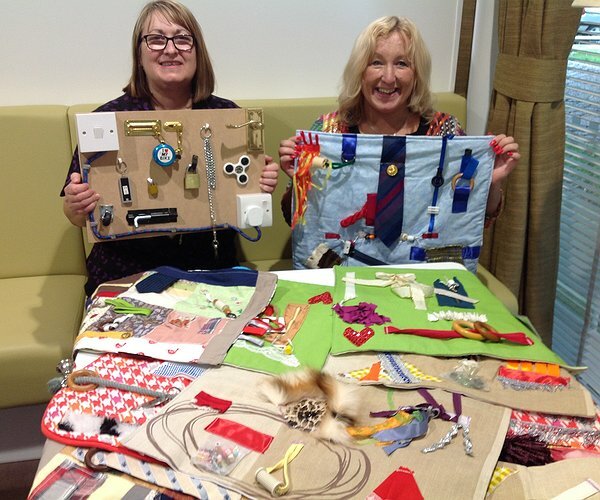 The idea came after Sharon Wallace, founder of ‘Hand Made for Dementia’ visited the Chirk Court care home in Maes y Waun, Chirk, with some of their creations which help sooth and relax people with dementia. “The items provide a safe and comforting way that those with dementia can ‘ touch and twiddle’ with items and textures that are soothing and also provoke memories,” said Mandi Southern, Activities Coordinator at the scheme, who said that Sharon is also a professional singer who regularly entertains the residents at Chirk Court. Sharon is looking for donations of items such as brightly coloured soft wool, buttons, bells or ribbon. “‘Fidget board’ items such as switches, handles, padlocks, keys or keychains, the sort of thing that might be found in a tool box, would also be much appreciated, said Mandi who said items can be left at Chirk Court to pass on to Sharon. "Tea party welcomes new scheme neighbours "
"Great teamwork creates new ‘Trim-trail’"